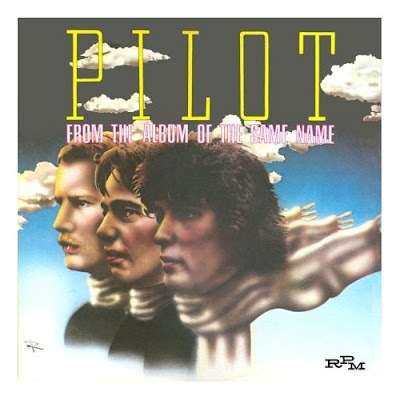 Here in the U.S. of A., PILOT are best known for their hugely successful 1974 hit "Magic". I must admit that, 35 years after the single's release, it remains one of my all-time favorite songs. EVER! I've never been able to get enough of it and no matter how many times I've heard it, I want to hear it again. It'd be safe to say that I've heard the song more times than I've heard any other song in my life bar The Beatles and Elvis Presley catalogs. On average, I play the song no fewer than 100 times a year (probably twice that), which is more than almost any other song in my entire collection! So, when the chance came up to review RPM/Cherry Red's remastered reissues of the first three PILOT albums, I jumped on it. I almost couldn't sleep for the week or so it took for the CDs to arrive. Once I had them in my grubby little hands, I couldn't sleep for another week until I had full absorbed them again into my system. I still can't sleep since they songs are constantly spinning in my head, day in and day out! While some folks have compared Pilot to 'Power Pop' outfits like Badfinger, The Raspberries and Big Star, I tend to think of them as closer to classic song stylists like Emmit Rhodes, Nilsson, 10cc, Gilbert O'Sullivan and, of course, solo Paul McCartney. It's not that they band are world's away from 'Power Pop', but that term, to me, conjures up a guitar-based sound, whereas Pilot were all over the map yet relied more heavily on piano than chiming or crunchy guitar chords. Harmony-wise, Pilot were right up there with the best of them. Initially, Pilot were a trio consisting of David Paton, Billy Lyall and Stuart Tosh. These three gents had spent their formative years separately as session musicians and played in many a live band, but they never tasted real fame until they joined together as Pilot. In two short years, the band recorded their first three albums and made a real impact on the music scene in the UK, Japan and across Europe. The U.S. fully embraced their debut single, "Magic", but the band were never able to tour and capitalize on their success over here and they sadly remain a one-hit wonder in the States. If "Magic" is all that you know by Pilot, then do yourself a favor and check these reissues out pronto! You won't regret it! Ho, ho, ho, it's magic, you know!